The lawyer of Joran van der Sloot, Maximo Altez, now says that his client was threatened by director Eddie Samame stay in an isolation cell where he would not talk with Beth. Joran would be forced to him the mother of missing Natalee to talk to. Altez announces a law to institute proceedings against Beth Holloway and our program, because of "bribing public officials." He thinks the access to the prison to "wrongful means" have taken place. Peter is surprised by the announced measure: "This is weird, because there is at the highest level authorized for this action. The director has just been commissioned from on high to work. Condition was not on the case of Stephany Flores would be discussed. That we met. There is nothing on our side at all inappropriately done. Everyone knew what would happen, no one was misled. " "There is no question of corruption. There we no money, no peso, real zero point zero, paid to enter the prison. That Joran's lawyer that he now calls a procedure to Beth and me tightens due to the bribing of prison authorities, indicates that the man but out of his neck talking, because there's no question of that. It has admitted Beth from compassion, so all the excitement that now arises I do not understand. " 1. Your current course of action or speech has no useful result. 2. Trifling and frivolous; idle: the futile years after an artistic peak. These adjectives mean producing no result or effect. These adjectives mean producing no result or effect: a futile effort; a barren search; bootless entreaties; fruitless labors; an unavailing attempt; a useless discussion; vain regrets. publication: diabierna, 11 feburary 2011.
oranjestad (aan): the lady here of 72 year of edad, owing to bay aeropuerto for 6’or of morning for take the vuelo of tiara air for curacao. all cos owing to bay good at the check- in, y after bay for vertrekhal. according his child owing to give declaracion at daily paper, pasando inmigracion drentando the sitting-room, was have one step where is dark y not indicacion cu have one step eybao. cual my mother owing to cay all his largo upstairs the floor y golpeando his cara, eye y the leg they. y thanks at sra. sha wever owing to help my mother where dune asistencia necesario. jammer i am achieve cu none person of aruba airport authority not did take contacto cu my mother y neither cu familia for look at con owing to follow cu my mother. “mi is achieve much jammer cu one aruban at not have atencion but let if is one mericano or dutch where at is demanda aaa. Using the Dutch Google translator also, I think he had an infection in a gland in his neck that required surgery. The article said he would be back to work in a week. minister president mike eman have some day at home cu one quebrante of salud. after of one intervencion medico diminutive eman is recuperando. is deal of one infeccion of one klier behind his nek cu was rekiri one intervencion cirurgico chiquito diabierna nightfall. first minister y his madam doina wanted owing to gradici everybody cu of one or another form owing to show interest in his salud y wanted owing to sigura they cu the is in the hands experto of dr.tim peterson that owing to dun’e all atencion necesario. diahuebs nightfall one great cantidad of fanatico specialmente child muhernan young owing to present masalmente at crystal theatre. 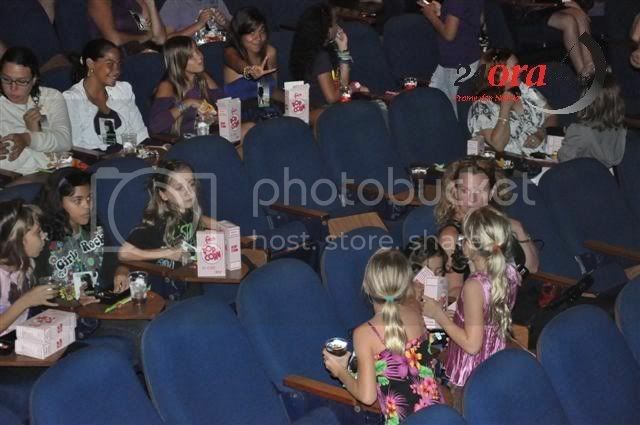 this was at ocasion of the estreno of the pelicula justin bieber at aruba. At first I thought maybe Justin Bieber was performing in Aruba (I was going to Tweet him and tell him it was a mistake) but then I realized all the "hooplah" was simply to watch his movie. Julia Renfro has three beautiful young daughters fast approaching the age when they could fall victim to the likes of another Joran. Why can she not empathize with Beth? 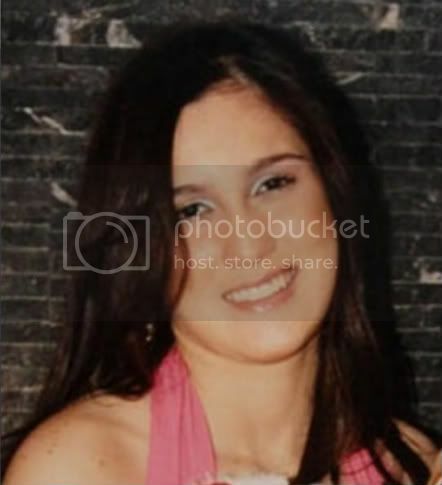 Renee Gielen:- Tito, ask her where Natalee is and why she told so many lies, ordered and/or paid people to hide the truth. Edit: No need to link to RU - everyone in the NH forum knows where it is and how bad it is. Janet - I know you are just trying to follow the normal rules but there are some "different" rules long used in the NH case and we really don't want links to RU or other NH hate sites. It appears that early on ... Tito Lacle was not a Joran empathizer ... he had not climbed on the Julia Renfro / Renee Gielen band wagon. 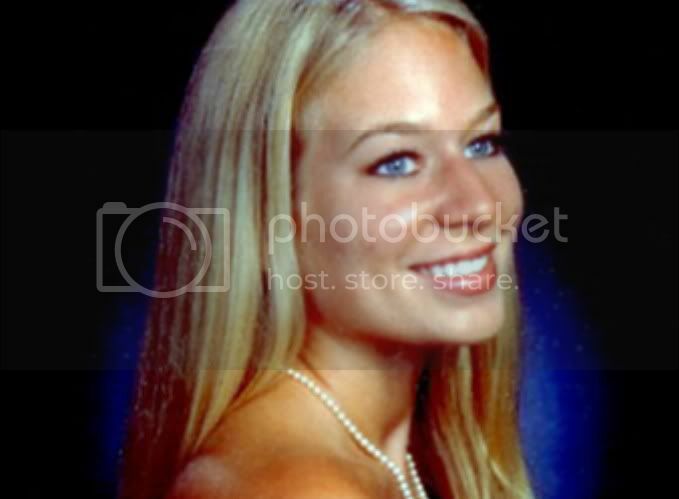 GRETA VAN SUSTEREN, HOST: Tito, last night we had on the new lawyer for Natalee Holloway's family, who said that a young woman came to her office and said that she had been sexually assaulted by Joran. Are there other women or young women who have come forward? 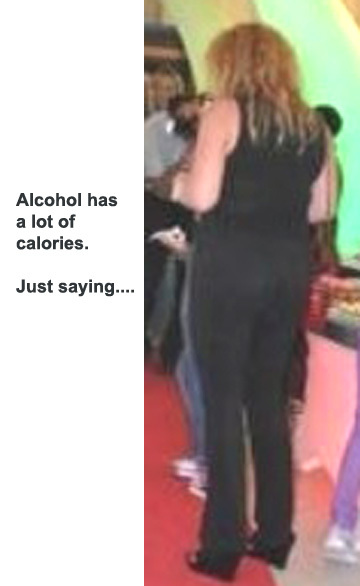 I mean, there seems to be a lot of people are talking a lot about it, but do you know specifically if this is fact? TITO LACLE, ARUBA TODAY: This is fact, Greta. The lawyer for Joran van der Sloot did confirm yesterday that not one but several people had been interrogated, or he confirmed my story that I heard from my sources, and he confirmed that many people had come forward. He did not give a specific number. He did mention the States and Aruba, that this has happened, and based on that information, that they put this accusation on Joran van der Sloot yesterday. Tito Lacle:- No perde dialuna den hot seat Papia Cla. Invitado Beth Twitty. Pakico e la bin? 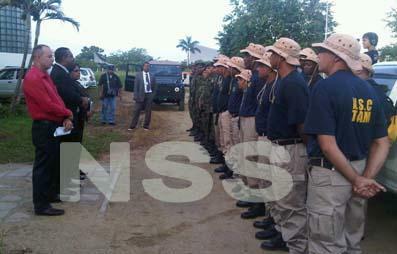 It is unlikely that the Netherlands soon take a decision on cooperation with the Surinamese police and defense. Because there was no new government in the Netherlands there are no such decisions Genon. Construction projects are being made to stand back burner. Outgoing Minister Ernst Hirsch Ballin of Justice and Home Affairs last month met with various officials on police cooperation with Suriname. The minister wants to establish criteria by which the partnership to run. But when they get there is unclear. 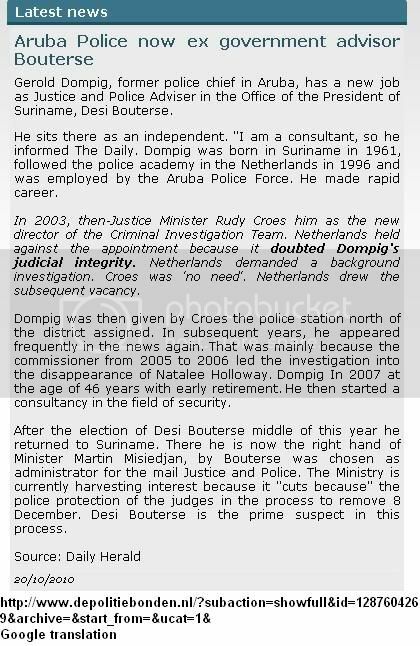 Gerold Dompig Director at the Ministry of Justice and Police said that Suriname is willing to cooperate: "We want everyone together." But it should work both ways: "If a partner withdraws cooperation, you should think about relationships." From the Netherlands has not yet been notified. However, the financing of construction projects virtually silent. The construction of police headquarters building and the new district is therefore temporarily on the backburner. Suriname does battle with illegal gold miners. The government, millions in tax revenues as the environmental pollution looting of mineral resources in the interior. The government now sends teams to the interior for small miners to register. 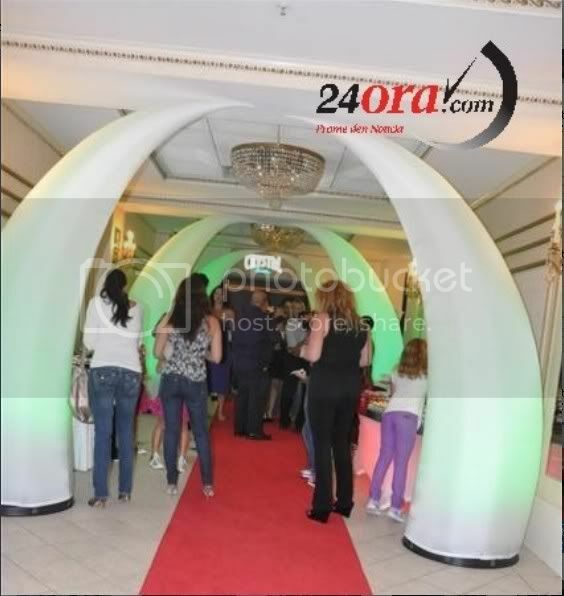 Correspondent Hennah Swivel spoke before leaving with Gerold Dompig of the Team Planning Policy Team Gold Sector. "We want a picture of what is happening, because there are an estimated 30,000 miners working in the interior," says Dompig. "This estimate is based on the number of mosquito nets provided by the Malaria Control Service." Suriname has in recent years because free mosquito nets provided to prospectors. One of the motives for registering the pollution: "We want to prevent the hinterland is left as a Swiss cheese contaminated with mercury." In small-scale mining, mercury used in gold mining. The liquid, heavy metal is taking into the groundwater. 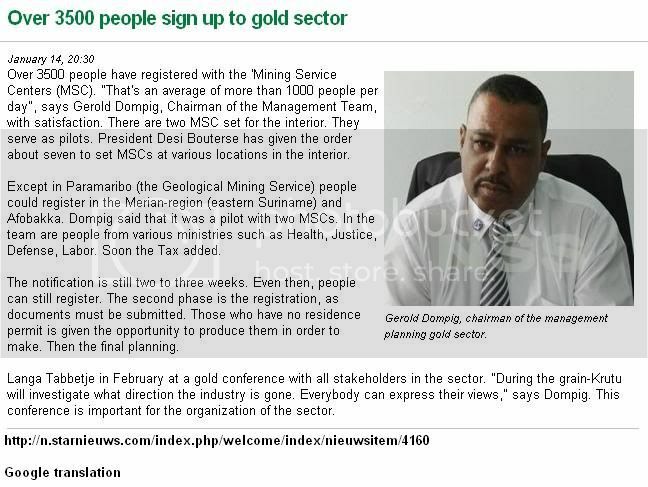 PARAMARIBO, Suriname -- In a bid to increase state revenues from the small-scale gold mining industry, the Bouterse administration in Suriname on Monday started registration of miners, so-called porknokkers, and others involved in the booming sector. According to government officials, the small-scale gold sector has an estimated turnover of US$1 billion a year. Official statistics indicate, however, that while over 20,000 individuals are thought to be employed in the industry, only 115 miners were formally registered and operating with a licence. These 115 gold producers in 2009 paid a mere US$40,000 income tax, said Tony van Dijk, Head of the Tax and Customs Administration. During an information session with stakeholders, several speakers noted that, taking into account the benefits the industry would have for the national economy, the government needed to bring order to this sector so that its revenues will benefit the entire nation. Van Dijk proposed a new taxation system for the small-scale gold mining sector similar to the taxation of the casino industry. He suggested that miners pay tax on the number and capacity of their equipment, irrespective of their turnovers. To facilitate a smooth operation at the end of January, three mining service centres will be opened in Langatabiki, Kwakugron and Afobaka. At the end of the operations a total of seven of these so-called one-stop windows will be established throughout the interior, where miners could pay tax and do other business with the government. Meanwhile, the chiefs of the tribal communities in Suriname have expressed support for the government’s efforts to bring some order in the gold mining industry, which is mainly taking place in their areas. During separate meetings with Head of the Structuring Committee, Lt Colonel Melvin Linscheer, Chief of the Paamaka Tribe, Samuel Forster, Matodja Gazon of the Aucaners Tribe and Chief Itomadi “Miep” Pelenapin of the Wajana Amerindians noted that they support the efforts since they will benefit their people. Chief Pelenapin said that the structuring is necessary since this will lead to more safety for the residents of the Amerindian villages, while Gazon welcomed the initiatives, which would enable his people to receive formal training in the mining industry. On several occasions President Desi Bouterse has deplored the “chaos” in the sector, which he labeled “a wild-west situation” needing regularisation. Are we providing links to the dark side now? Janet - I know you are just trying to follow the rules of the forum but the rules are actually a little different in the NH thread/case. All of us still left following this case are well aware of the hate sites and we really don't want to give them any more credit for their vile lies. Thanks for understanding. Three "Mining Service Center teams are ready to get started today with the registration of people working in the gold sector. In Paramaribo, the headquarters of the Geological Mining Service (GMD), registration has already begun this morning. In the morning there were people who wanted to register. Two teams go today to the interior, the Merian area in eastern Suriname and Brokopondo. Before leaving, members of the MSC team addressed by the chairman of the management, Gerold Dompig. The people were given the final instructions. They were printed on the heart at this stage the individuals active in the sector, only to record. People should be informed about the organization of the sector. I do. How about "Source: RU"
Page created in 6.248 seconds with 19 queries.